Mules N' Honey: Puppy Love- I'm getting a dog! When are you expecting your new puppy? I vote blue all the way. My niece, who grew up on a farm, always had Queensland's. She loved them. I am partial to Rottweiller's since that it what I grew up with. Now I have a 5 pound Austrailian shepherd that should get to about 18 pounds. Now if only he would potty train himself. 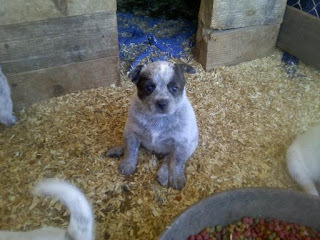 The puppy will be at our home in mid to late February! We are excited! Karrie--Ryan is right, just had to say that...heelers are GREAT dogs! Had a few the first 19 years of my life...they are loyal, smart, protective of your family and they work cattle really well! Will go anywhere and do just about anything. Everybody loves pupy love Who can abide those beautiful little faces and wet noses? Puppies can be a lot of fun, but they additionally arise with a lot of added responsibility.